Getting the most out of your summer wardrobe when it comes to autumn is all about mixing and matching with the right things. 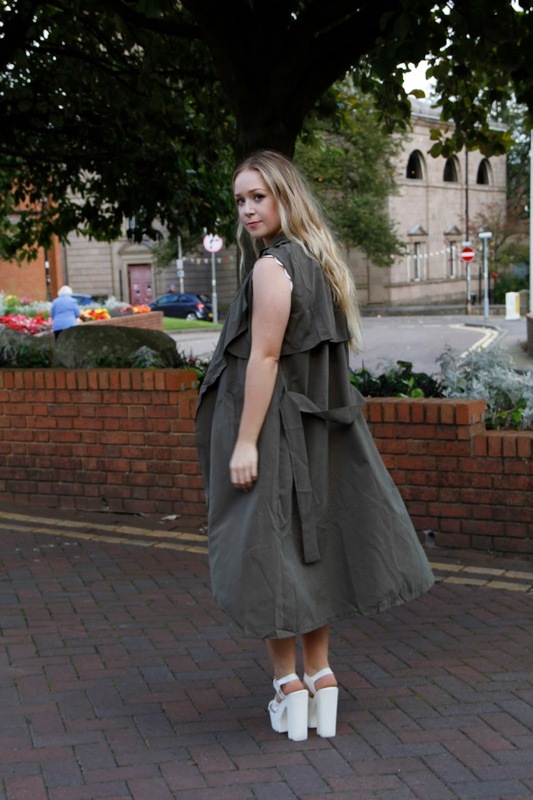 So when I received this gorgeous Limited Edition Co-ord from Luxemme I knew it would be perfect for a weekend with the girls, and would look amazing with autumnal accessories like this Sleeveless Trench Coat from CNDirect. This two piece really caught my eye as it's unlike anything I have seen on the high street at the moment. The scallop hem, lace up detailing and metal embellishment means I can stand out from the crowd while looking effortlessly chic due to the fact that it doesn't even need accessories. Paired with this waterfall style khaki coat, I'm all set for the transitional period when it comes to weekends in September! Love this look and how on trend it is! I nearly picked that Luxemme co-ord!! But chose a white lace one instead - so impressed with the quality of their stuff to say they're quite cheap! What a lovely two piece - I love the scallop hem detailing, so pretty! Those shoes are also so gorgeous! !